Granny’s Classic Homemade Lasagna recipe has been perfected over the years. 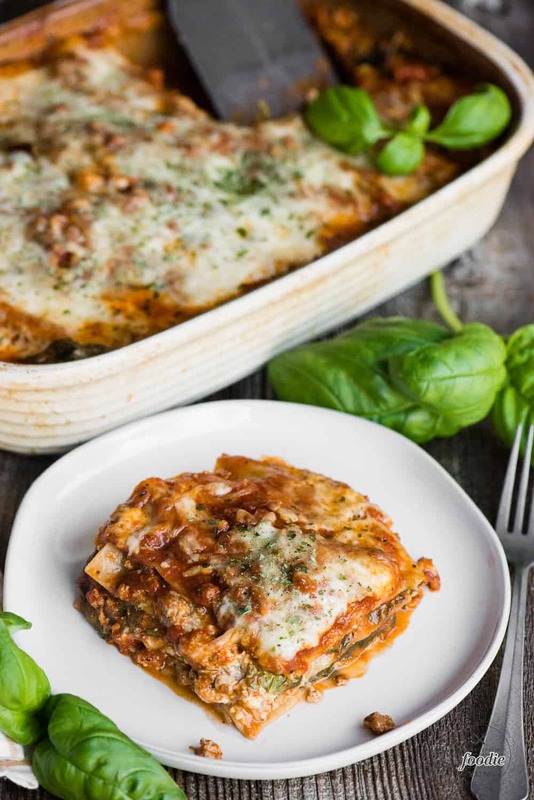 This is the absolute best lasagna recipe you will ever find! Italian sausage, spinach, basil, and four melted cheeses come together in this satisfying and flavorful dinner. Granny’s Classic Homemade Lasagna is a family recipe that has completely evolved over the years. 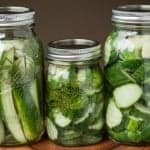 It started out as a very basic recipe that we enjoyed when I was a kid. Then, as an adult, I’ve tweaked my lasagna recipe over and over again until I can now confidently call it the BEST classic lasagna recipe that you will find. I’m sure that if I ever make it to Italy, I’ll learn about a hundred different ways to make this a more authentic Italian lasagna recipe. But, for now, you can trust that this is the absolute best (American-ized) lasagna recipe you’ll find. It has taken me decades to perfect, but I’m confident my kids will be making it this way for their own family. When making lasagna do you cook the noodles first? There are two types of lasagna noodles – the type you have to cook first and the type you are not supposed to cook first. My personal preference is to use no cook lasagna noodles. Why add that extra step of having to boil the lasagna noodles first? Then, when you do, they stick to one another unless you are very careful. No boil lasagna noodles are not only easier to use with less clean up, but I also feel that their final texture once the lasagna is fully cooked is better than lasagna noodles you have to boil first. Absolutely! In fact, this is one of my many secrets to making the best classic lasagna that I list below. This lasagna recipe is actually one of our favorite things to serve for dinner when friends come over. Why? Because I can do all the prep the day before and only have to pop it in the oven when our friends get here. It feels sooooo good to have the kitchen start and stay clean when company comes over. Lasagna is one of the best make ahead dinner recipes you’ll find. The other reason it’s best to make lasagna ahead of time is it gives the pasta time to absorb a lot of the liquid and flavor. How long can uncooked lasagna last in the fridge? My personal preference is to make the uncooked lasagna the day before you are planning to cook it. I have found that gives me the best results. I have, however, made lasagna two days before I cook it and it turned out perfectly fine as well. You just need to keep in mind the shelf life of the ingredients. They fresher they are, the more wiggle room you’ll have as far as how long it will last in the fridge. I may be a little OCD about my lasagna prep, but I’m a firm believer that lasagna should have four noodle layers, three inside filling layers, and a topping of melted mozzarella and sauce. Does it really matter how many layers you have? Not really. The thicker the lasagna, the longer it will take to heat thru. The thinner the lasagna, the faster it will cook. I’ve found that about 4 layers yields a perfectly thick, visually appealing serving of lasagna. 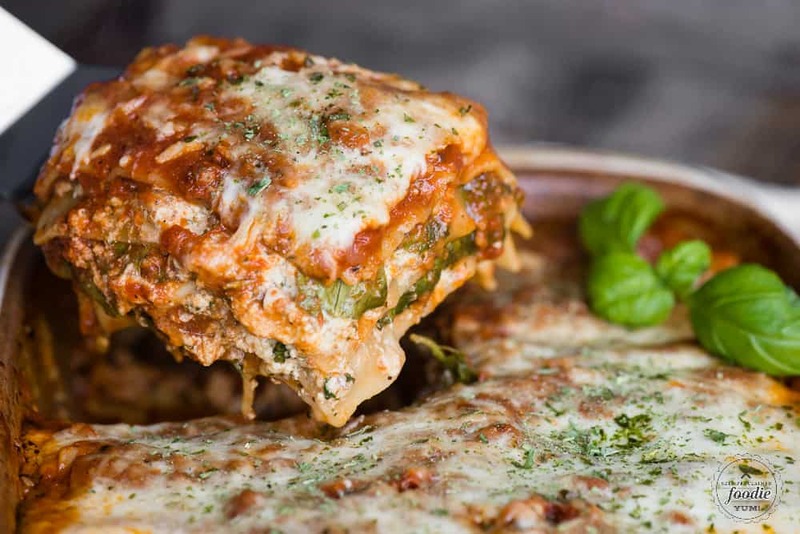 What is the proper way to layer lasagna? A thin layer of sauce must go on the bottom of your casserole dish. This will prevent any pasta from sticking. Then goes the no boil lasagna noodles. 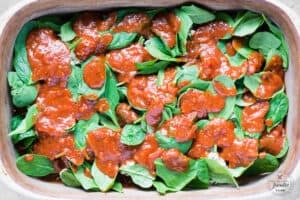 On top of the lasagna noodles goes one third of your sausage and ricotta mixture, then a layer of fresh spinach, and that is all topped with a generous amount of sauce. 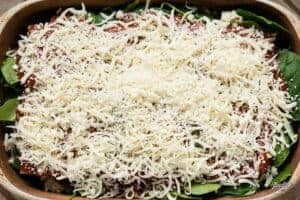 I like the pasta sauce to be on top of the spinach and directly under the next layer of pasta so that the moisture goes both ways. Repeat this process of layering no boil lasagna noodles with the ricotta sausage mixture, spinach, and sauce two more times. Top with your final layer of pasta followed by the remaining amount of sauce as well as the shredded mozzarella. The result is a perfectly layered, evenly proportioned, best tasting lasagna. Trust the process. Do you put egg in ricotta cheese for lasagna? If you have some kind of egg allergy or have simply run out, you can always omit the egg. But, like in most recipes, the egg acts as a binder and helps keep the ricotta mixture cohesive. A good egg also adds richness to any recipes. Okay, here it goes, folks. After years and years of semi-okay attempts at lasagna, here are my secrets to making the absolute best lasagna you’ll ever enjoy. None of these are absolutely necessary, but I’ve found they make a huge difference in creating the best tasting classic lasagna. Use no boil lasagna noodles. Like I said above, they’re not only easier and quicker, but I actually prefer the texture as they never get over cooked. I love spicy Italian sausage in my lasagna but for some reason, I don’t like getting a huge chunk in a single bite. I found out by accident that there is a better way. You see, when I was making the filling for my meat and cheese ravioli, I pulsed the cooked sausage in the food processor into tiny crumbles and then mixed it with the ricotta. I had leftover filling and turned it into a lasagna. Voila! It was perfect! Now, every time I make a sausage lasagna, I pulse the cooked meat in the food processor to make it smaller. Whole milk cheese. For the love of all things, be sure to buy whole milk ricotta and whole milk mozzarella. It will yield the creamiest and richest lasagna. Whoever came up with low fat cheese should be punished. The secret ingredients in my ricotta filling are roasted garlic, lots of fresh basil, parmesan and pecorino cheese. If you don’t always have roasted garlic on hand, you should. I use it in sooooo many recipes. 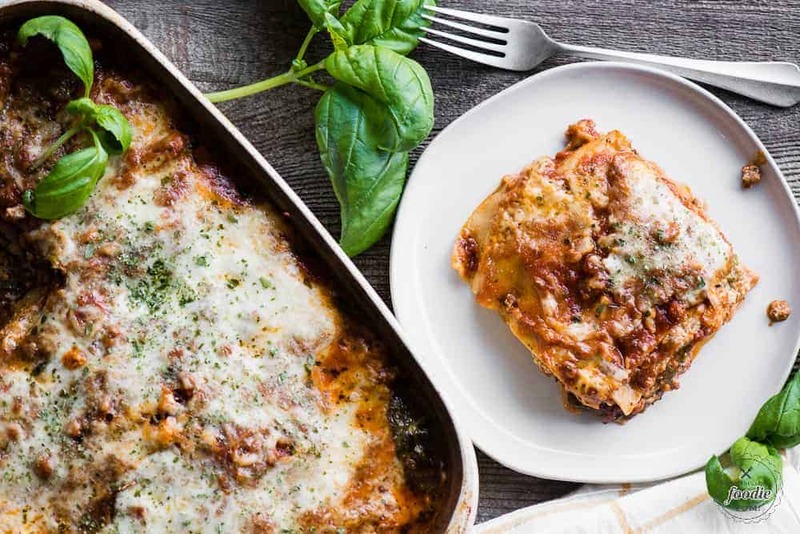 I used to make lasagna without these four secret ingredients and let me tell you – they are incredibly worth it. And finally, you will get the best tasting lasagna if you make it the day before and let it rest at least 20 minutes after you take it out of the oven. Why is my lasagna runny? This has happened to me countless times but I now know how to avoid it. Both the sauce and the spinach have a lot of moisture in them. 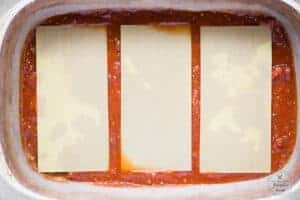 If you don’t make your lasagna ahead of time and just pop it into the oven, you won’t give your pasta sufficient time to absorb the liquid in the sauce. Also, when you cook your lasagna, the spinach will release a bunch of liquid. To avoid a runny lasagna, be sure to remove the foil during the last phase of cooking to help release some of the moisture. It is also very important to let the lasagna rest after taking it out of the oven. This allows the lasagna noodles to further absorb any remaining moisture. Don’t worry – it will still stay hot! Granny's Classic Homemade Lasagna recipe has been perfected over the years. 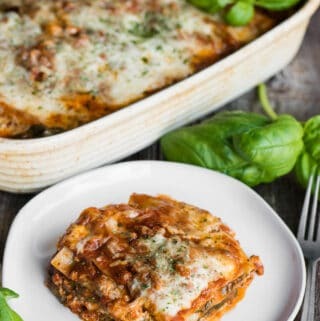 This is the absolute best lasagna recipe you will ever find! In a large pan over medium high heat, cook the Italian sausage until browned and crumbly, stirring occasionally. This should take about 15 minutes. Transfer to a paper towel lined plate and allow it to cool slightly. Use a food processor to mix the basil, ricotta, pecorino, parmesan, egg, and half of the mozzarella, . Add the cooked sausage and pulse a few times to break the sausage into crumbles and mix it into the cheese mixture. To assemble the lasagna, add about a cup of the pasta sauce to the bottom of a 9x13 inch baking dish. Add 3 of the no boil lasagna noodles. Add about 1/3 of the sausage mixture to the top of the noodles. Add about 1/3 of the fresh spinach leaves and top them with about a cup of the sauce. 1. pasta, sausage mixture, spinach, sauce. 2. pasta, remaining sausage mixture, remaining spinach, sauce. 3. top layer will be remaining pasta, remaining sauce, and remaining mozzarella. Cover with aluminum foil. For best results, refrigerate overnight. 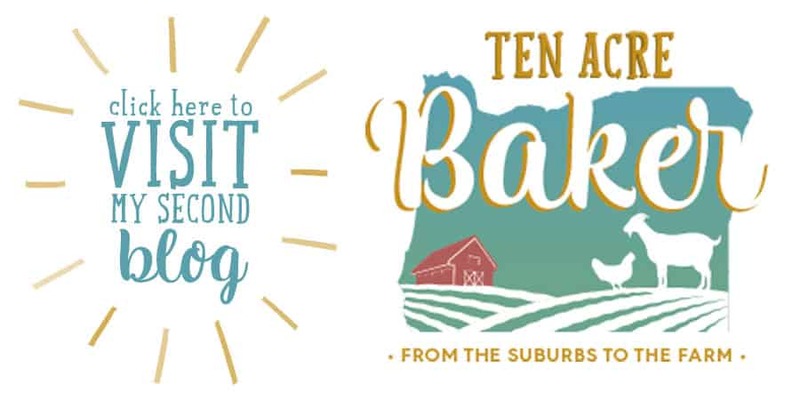 If needed, you may bake right away. Preheat oven to 400 degrees F. If previously refrigerated, be sure to allow lasagna to come to room temperature before cooking, otherwise your cook time will be extended. Cook, covered, until heated through, 40-60 minutes. You may remove the foil for the last 5-10 minutes of cooking time to help melt the cheese and release some of the moisture. Allow lasagna to rest for 15-20 minutes before serving to absorb any remaining liquid. 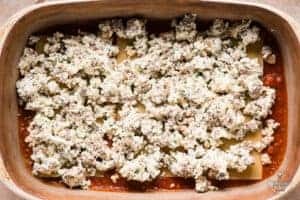 This lasagna recipe is best if made the day before you want to cook it so that the no-bake pasta can soak in the sauce, but you can still bake it on the day you prepare it if needed. 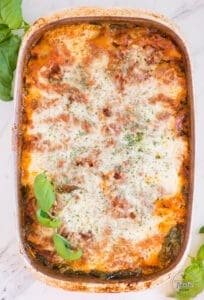 I prefer using Trader Joe's no boil lasagna because the pieces fit perfectly in my baking dish, especially once they expand when cooking, but you can use any kind you like. You can even make your own homemade pasta sheets. 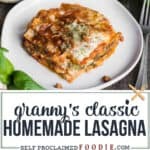 granny recipes sound really good i use cottage in my lasagna must try. im going to give you 5 star because the recipes sound really good. Hi Peggy, I’ve never tried cottage cheese in my lasagna. Do you use it instead of or in addition to ricotta? I’ll have to try it. Thanks for the suggestion! Hi Larry, If you hover over a picture there should be a button to PIN the recipe. 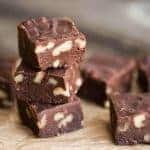 Are you on mobile or desktop when you’re viewing the recipe? Let me know and I’ll try to see if it’s not working. Thanks! “Whoever came up with low-fat cheese should be punished.”? Krissy, you are spot on. I feel the same way. You have an awesome sense of humor. I love your emails and recipes and have loved every one that I have made. Keep them coming, you’re doing a fantastic job. I will definitely be making your lasagna. Your comment totally made my day. THANK YOU! So glad you’re enjoying the recipes. This is a new family favorite – thank you!! This looks so delicious I can almost smell it! I too am a fan of no boil noodles – delicious and so easy! Lasagna might just be the ultimate comfort food, and the more cheese the better I say. This looks epic! Your lasagna looks very good. 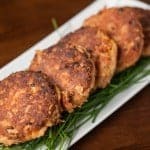 I love the sausage ricotta filling! I normally use fresh lasagne sheets, either homemade or bought ready-made. 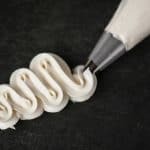 These don’t need to be precooked which as you say can be a hassle, especially when they stick together!